Here’s a gift for all those who are without their mothers today, for one reason or another, and for those mothers who are without their children today, for one reason or another. My own children are in Australia while I am in Singapore, so while we have spoken on the phone, we cannot be together today. My mother died on July 22 last year, so this is my first Mother’s Day without her. In fact these things, so laboriously made by other mothers, are more about pleasing the rest of the family and raising funds for the local school than about pleasing mothers. And while I’m at it, here are a few other things I don’t want for Mother’s Day: anything electrical, especially anything for the kitchen. Come to think of it, nothing for the bedroom either – unless it’s another DVD player. Don’t give me a cookbook either – give me a cook and make him tall dark and handsome. Come to think of it don’t give me a book at all, unless you give me time to read it. And don’t bother giving me breakfast in bed unless you know what I like for breakfast. It is depressing to be handed a cup of tea by someone who doesn’t know whether you have sugar or not because they never make you one on the other 364 days of the year. And definitely no chrysanthemums, which must be the worst smelling and least attractive flower in the known universe. Lest you think me alone in this ingratitude, let me introduce you to a few of my ungrateful friends. My friend Karen, a primary teacher and mother of three, says Mother’s Day presents are among the worst she’s ever received and the worst of these usually came from the Mother’s Day stall. Then there’s my friend Lynne, who once received a stud-finder for Mother’s Day She was quite impressed until she found out it was one of those things that helps find the wooden beams behind the plaster in the walls. Her husband thought she might like to help him with the home repairs, but eventually she went off and found another sort of stud. The trouble with Mother’s Day is that it’s yet another day when mothers have to grin and bear it. It’s not that I don’t enjoy the endearing cards with drawings depicting me as a lop-sided spook. Or the oddly shaped parcels wrapped with more sticky tape than paper, containing objects d’art that have to be sent off to a laboratory to be identified. These labors of love are the upside of mother’s day. It’s not even the commercialism that bugs me. Every event associated with gift giving is abused commercially. What bugs me about Mother’s day is that the gifts are so cliched and stereotypical. Breakfast in bed, flowers, slippers, dressing gowns, nighties, kitchen gadgets, and a special dinner to give mum “a day off”. All these recognize us in our roles as mothers, but not as people. I know the whole point is to celebrate motherhood. But the whole point of Christmas is to celebrate the birth of Christ, but it’s not compulsory to given everyone a nativity set and a bunch of Christmas lilies. Part of the problem is that the egocentricity of childhood means that it sometimes takes years for us to really get to know our mothers as people. Until then it’s difficult to think of anything really personal. Chief among the things I don’t want for Mothers’ Day, is an apple corer. And after 45 years, I now know that my mother probably didn’t want one either. But back in those days, I didn’t know what she really wanted, so I bought the thing that most impressed me in order to impress her. These days I know what she’d really like to do with an apple-corer. My friend Carolyn, legal service director and mother of two, avoids both the guilt and the presents by ignoring Mother’s Day all together. Her own mother hated the obligatory Mother’s Day family gathering, and made it very clear she wasn’t interested in Mother’s Day. She said people who made a big fuss over their mothers on Mother’s day were often those who felt guilty or who did not have a good relationship over the rest of the year. That’s what I tell my mother when I forget, too. But having established what we don’t want – what ­do we want? So, I ask my friend Karen. “If I had to put in an order, I’d like to be thin,” she replies. That’s a tall order, but Karen assures me that her GP is looking into it on her behalf. Apparently there’s this pill you can get that gives you the runs every time you eat fat. It combines therapy and exercise all in one. Her aim is to look like all those mothers in the Mother’s Day ads, serene, thin and not a day over 25, despite being surrounded by teenage children. Seriously though, for Mothers’ Day, Karen and I agree that we’d like to be left alone with a good book or video and a bottle of wine – or two. A good Mother’s Day is not about presents. A good Mother’s Day is a day to do what you want to do – not what you have to do. Because a day of doing what you have to do is just like every other day. 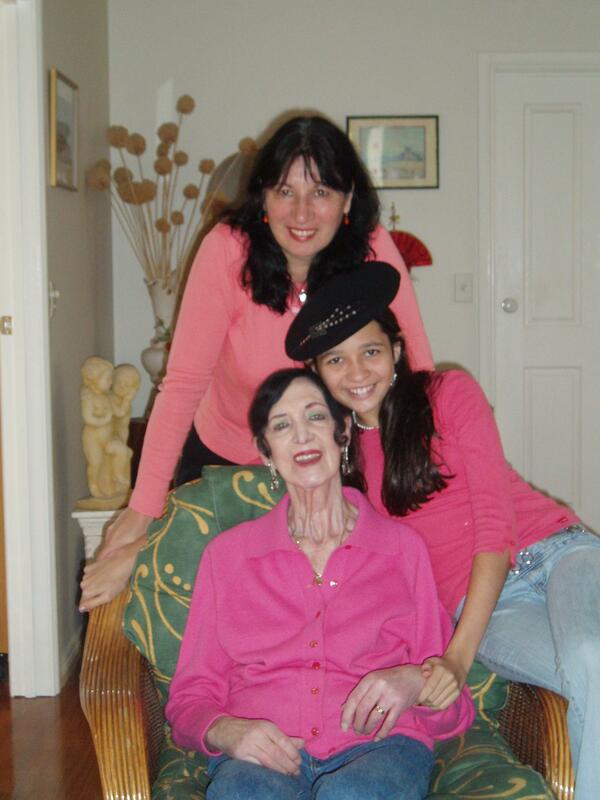 Below: me, my daughter, Greta (then aged about 12) and my mother, Lorraine, (then about 76).